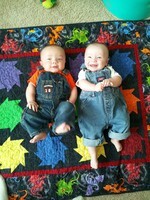 Twin boys Mason and Zachary - born April 2012. 2011 and 2012 were filled with the highest ups and the lowest downs. After trying to build a family for several years, we finally conceived our boys on our 3rd round of IVF. Only 20 weeks into my twin pregnancy, I got very sick with preeclampsia and what they thought was HELLP syndrome. At 22 weeks, I was hospitalized in the hopes of saving the pregnancy. After 10 weeks on strict bedrest, our boys arrived eight weeks early. They spent four grueling weeks in the NICU, and it is a true miracle that we have two healthy boys today. We just celebrated Mason and Zachary's 2nd birthday - a miracle we have survived! Motherhood is by far the most difficult job I have ever held, but I wouldn't change it for the world! In April 2013, my parents and I took the boys on a month long, 2,600 mile road trip to visit family in Ohio. What an adventure! The boys are troopers and did much better than I anticipated. They loved traveling in the motorhome and loved spending time with their relatives! Nikki Barnes Love has a birthday today. Nikki Barnes Love posted a message. Nikki Barnes Love updated her profile. View. March 11, 2006 - Our Vegas wedding! Helicopter Ride to the Grand Canyon!